I still strongly prefer the classic look of this type of clock over the fancy new clocks packed full of LED lights. However, my alarm has far too many benefits to give it up for a clock that doesn’t even do half of what it can. Well although this clock features a very classic look, it at least has a little bit of a modern twist. It won’t work as a dock or double as a radio, but it at the very least can utilize MP3s to wake you up first thing in the morning. 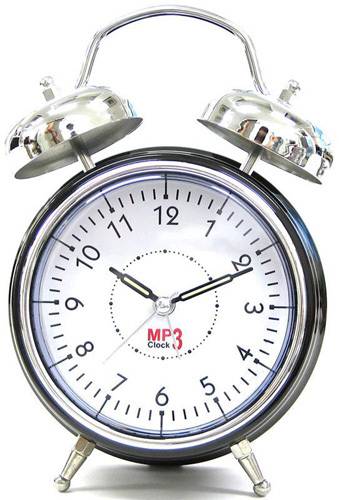 The clock has a very large sound bank to let you choose between different alarm sounds. Instead of choosing one of those, you could also add favorite songs or strange sounds you’ve recorded yourself. With the ability to record your own sound effects and use those, you could wake up every morning laughing, just as long as you get creative. To keep this running it uses 3 AA batteries. It’s compatible with Windows XP and Vista, so those on a Mac not using Windows will have some issues. To pick this up it’ll cost you ¥ 3,850.00 or about $41. How can I buy this clock ….